and their laws and their King. Unto thy seed will I give this land. I should much rather see reasonable agreement with the Arabs on the basis of living together in peace than the creation of a Jewish state. Apart from practical consideration, my awareness of the essential nature of Judaism resists the idea of a Jewish state with borders, an army, and a measure of temporal power no matter how modest. I am afraid of the inner damage Judaism will sustain -- especially from the development of a narrow nationalism within our own ranks, against which we have already had to fight strongly, even without a Jewish state. We are no longer the Jews of the Maccabee period. A return to a nation in the political sense of the word would be equivalent to turning away from the spiritualization of our community which we owe to the genius of our prophets. If external necessity should after all compel us to assume this burden, let us bear it with tact and patience. The legal status of Jerusalem is different from the territory in which Israel is sovereign. The United States has consistently taken the position that the final status of Jerusalem must be resolved among the parties concerned.... For that reason, we have refused to recognize unilateral acts by any party as affecting Jerusalem`s status. The battle is not about 20 outposts, nor about 20 apartments in the grounds of the Shepherd Hotel. Every house in every West Bank settlement serves one supreme purpose: to destroy any possibility for peace. Every Israeli house in East Jerusalem serves the same sublime aim. I tell them all that freedom is coming and is inevitable, and that occupation shall come to an end. It will either be the independence of the state of Palestine, living side by side in peace and security with the state of Israel on the 1967 borders, or equal rights for all of the inhabitants of the land of historic Palestine from the river to the sea. KING HASSAN II OF MOROCCO SAID IT BEST: "THERE IS NO SHAME IN DEALING WITH ONE'S ENEMY." INDEED, THE PRINCIPLES OF JUSTICE, THE UNITY OF BRETHREN (THE BLOOD AND THE BLESSED OF ABRAHAM), DEMOCRACY, AND ADAPTABILITY TO CURRENT REALITIES CAN BE UPHELD ONLY BY THOSE WHO ACT IN A TRUE SPIRIT OF REASONABLE COMPROMISE; FOR THEM, GOD WILLING, THERE WILL BE GREAT HONOR. THE 13 SEPTEMBER 1993 INTERIM ACCORD MADE IN OSLO BY ISRAEL AND THE PLO IS A STRONG INDICATION THAT THE PEACE TALKS STARTED IN MADRID IN 1991 UNDER THE SPONSORSHIP OF THE FORMER COLD WAR SUPERPOWER RIVALS, THE USA AND RUSSIA, ARE NOT NOW, NOR WERE THEY EVER, EFFECTIVE. THE SUCCESSFUL BLUEPRINT FOR A TRULY COMPREHENSIVE PEACE ON ALL FRONTS MUST GIVE CLEARLY DEFINED OBJECTIVES, BOTH INTERMEDIATE AND FINAL, IN WHICH ALL PARTIES HAVE EQUAL STAKES. 1. This Eight Part Peace Proposal for Greater Jerusalem is to be submitted to all the parties concerned as a basis for direct negotiations for a just and lasting and comprehensive settlementbetween Israel and its Arab foes. 2. This peace proposal is to be taken under consideration by all the parties concerned in accordance with Article 33.1 of the Charter of the United Nations, which enjoins all parties to any dispute to seek a solution by various means, including "other peaceful means of their own choice." 3. All negotiations for the implementation of this peace proposal are to be conducted within the framework of an international peace conference that will include all parties to the dispute as well as the United Nations Security Council, including both the five permanent members as well as the current non-permanent members. The conference will act in accordance with the provisions of the Charter of the United Nations and will consider all United Nations resolutions that pertain to the Arab-Israeli dispute. 4. Each part of An Eight Part Peace Proposal for Greater Jerusalem exists in the context of the entire proposal, and the implementation of any one part shall be accomplished with the understanding and determination that all the other parts will be put into effect as well. PART II IS DESIGNED TO PROVIDE A BUFFER STATE BETWEEN THE MAIN POWERS IN THE REGION: ISRAEL & SYRIA. THE PROPOSED STATE IS IN NO WAY INTENDED TO REPRESENT THE ULTIMATE ASPIRATION OF THE PALESTINIAN PEOPLE NOR IS IT MEANT TO BE A POINT OF TRANSFER FOR THE PALESTINIAN PEOPLE; IT IS A MEANS TO AN END AND A BADLY NEEDED WAY TO BUILD A CONSENSUS AND UNIFIED APPROACH AMONG THE ARABS, ESPECIALLY AFTER THE DIVISIONS THAT WIDENED AS A RESULT OF THE 13 SEPTEMBER 1993 INTERIM ACCORD BETWEEN ISRAEL AND THE PLO. D) Israel north of the 33rd parallel (see maps below). 3. The new state to be entirely without armaments of any kind, with the single exception of weapons for the King's militia. Moreover, the native inhabitants and all current residents of the regions described above will live undisturbed in their usual occupations and domiciles, except in cases wherein the power of eminent domain is exercised by the King. Furthermore, all newcomers and returnees as well as all current residents of the aforesaid regions will pledge allegiance to the King as a necessary condition for permanent residency and citizenship in the new state; otherwise, they must leave the land, but not without adequate compensation and proper relocation to a state of their own choice. PART III, WHICH IS INTENDED TO BE A PRELUDE TO NEGOTIATIONS FOR A JUST AND LASTING AND COMPREHENSIVE SOLUTION TO THE ARAB/IRANIAN-ISRAELI CONFLICT, CALLS FOR EQUAL FOOTING AS WELL AS A VOICE FOR THE PALESTINIAN PEOPLE IN THE ASSEMBLY OF NATIONS, WHICH IS NOT A GOAL OF THE 13 SEPTEMBER 1993 INTERIM ACCORD BETWEEN ISRAEL AND THE PLO. 1. The new state, to be called Aram (after the Biblical Hebrew name for the region), to be under the King of Jordan, just as Canada once existed and now exists and will continue to exist under Great Britain's monarchs. A formal agreement will be made between His Majesty's Government and the Provisional Government of the State of Aram for a peaceful and orderly transfer of authority to the Government of the State of Aram. But during the formative years of the new state, which period will be specified in the aforementioned agreement, the King will exercise absolute authority therein, and will decide foreign and domestic policies with regard to issues such as deployment and withdrawal of troops, water rights, treaties, security, trade, economy, borders, law, finance, civil rights, diplomatic recognition, and the modalities of admission for Palestinian Arabs from around the world, and other issues. 2. After sufficient time has elapsed for the establishment of law and order within the State of Aram, as determined in the aforesaid agreement, transitional arrangements will go into effect for a smooth and gradual transfer of authority to the Government of Aram. This procedure will continue until the goal of complete independence is achieved. No law or policy may be established if it contravenes any law, policy, or agreement resulting from implementation of this peace proposal. PART IV IS A STEPPING-STONE TO PART VI; THIS PROVISION ACKNOWLEDGES PALESTINIAN SOVEREIGNTY OVER THE WEST BANK, WHICH WAS MADE VERY CLEAR BY KING HUSSEIN IN HIS 31 JULY 1988 SPEECH IN AMMAN CONCERNING THE WEST BANK, AND WHICH WAS FORMALLY EXPRESSED IN ALGIERS BY THE PALESTINE NATIONAL COUNCIL'S DECLARATION OF THE STATE OF PALESTINE ON 15 NOVEMBER 1988. PART IV RESISTS THE EFFORTS, BOTH SUBTLE AND OVERT, TO BLUR THE DISTINCTION BETWEEN JORDANIAN AND PALESTINIAN IDENTITIES, AND TO PRESSURE KING HUSSEIN INTO RENEGING ON HIS SCRUPULOUS REAFFIRMATIONS OF THE RABAT DECLARATION OF 1974. The donation by the proposed Palestinian State of Aram, and the incorporation by Israel, of the entire West Bank region of the State of Palestine, except Jerusalem. This arrangement to be made by a separate treaty between Israel and the proposed Palestinian State of Aram. All current residents of the West Bank and all newcomers and returnees to the West Bank must either keep or else assume Israeli citizenship and all the rights and responsibilities thereof in order to be permanent residents there or anyplace else in Israel proper. All those who refuse the offer of Israeli citizenship must leave the land, but not without adequate compensation and proper relocation to a nation of their own choice. PART V IS ALSO A STEPPING-STONE TO PART VI; THIS PROVISION ACKNOWLEDGES PALESTINIAN SOVEREIGNTY OVER THE GAZA STRIP, WHICH WAS DECLARED BY THE PALESTINE NATIONAL COUNCIL ON 15 NOVEMBER 1988 AND SUBSEQUENTLY AFFIRMED BY THE GOVERNMENT OF THE ARAB REPUBLIC OF EGYPT ON THE SAME DAY. The donation by the proposed Palestinian State of Aram, and the incorporation by Israel, of the entire Gaza region of the State of Palestine. This arrangement to be made by a separate treaty between Israel and the proposed Palestinian State of Aram. All current residents of the Gaza region and all newcomers and returnees to the Gaza region must either keep or else assume Israeli citizenship and all the rights and responsibilities thereof in order to be permanent residents there or anyplace else in Israel proper. All those who refuse the offer of Israeli citizenship must leave the land, but not without adequate compensation and proper relocation to a nation of their own choice. PART VI IS THE CENTERPIECE OF AN EIGHT PART PEACE PROPOSAL FOR GREATER JERUSALEM; IT EMPHASIZES UNITY OVER PARTITION AND IS ACCORDINGLY SELECTIVE IN ITS INTERPRETATION OF UNITED NATIONS RESOLUTION 181. THE REAGAN PLAN OF 1982, THE FEZ ACCORD OF 1982, VARIOUS IDEAS PUT FORWARD BY SHIMON PERES AND EVEN THE 15 NOVEMBER 1988 DECLARATION BY THE PALESTINE NATIONAL COUNCIL IN ALGIERS ARE BUT VARIATIONS OF THE FAILED UNITED NATIONS PARTITION PLAN AND AS SUCH THEY ONLY SERVE TO PERPETUATE A "HOUSE DIVIDED," WHICH CANNOT STAND. 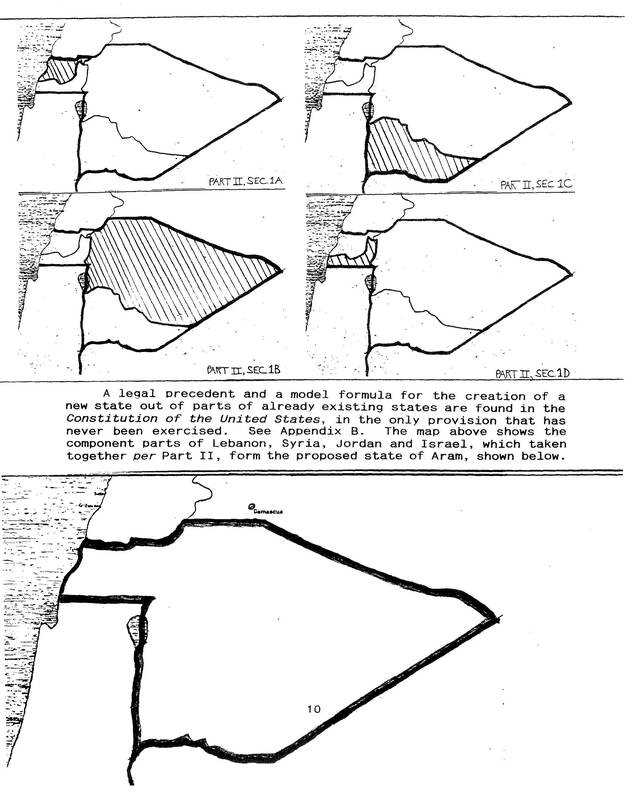 PARTS IV, V & VI ARE ADAPTABLE TO THE 13 SEPTEMBER 1993 INTERIM ACCORD BETWEEN ISRAEL AND THE PLO; THEY PROVIDE A BLUEPRINT FOR FUTURE GROWTH AND A MAXIMUM RANGE OF SETTLEMENT AND OPPORTUNITY FOR BOTH THE ARAB AND THE JEW, WITHOUT WHICH THE INTERIM ACCORD IS LIABLE TO DEGENERATE INTO AN ARRANGEMENT FOR THE PALESTINIANS QUITE SIMILAR TO THE AMERICAN INDIAN RESERVATIONS IN THE UNITED STATES OF AMERICA. 1. The creation of the State of Jerusalem as the Holy Patrimony of Christians, Muslims and Jews alike. The new state to be initially under the administration and protection of Israel. The lines and the laws of the new state -- including a Constitution and a Bill of Rights for all its citizens -- to be drawn by the parties concerned under the supervision of a special mission appointed by and working under the auspices of the United Nations, in accordance with the provisions of the Charter of the United Nations as well as all applicable United Nations resolutions that pertain to the Arab/Iranian-Israeli dispute, including Resolution 181, which affirms by a solemn agreement among nations that Jerusalem is a separate entity from Israel proper. 2. Upon ratification of the aforesaid measures by a treaty between the Government of Israel and the Government of the proposed Palestinian State of Aram, transitional arrangements for the complete transfer of authority from the Government of Israel to the Government of Jerusalem will commence. 3. 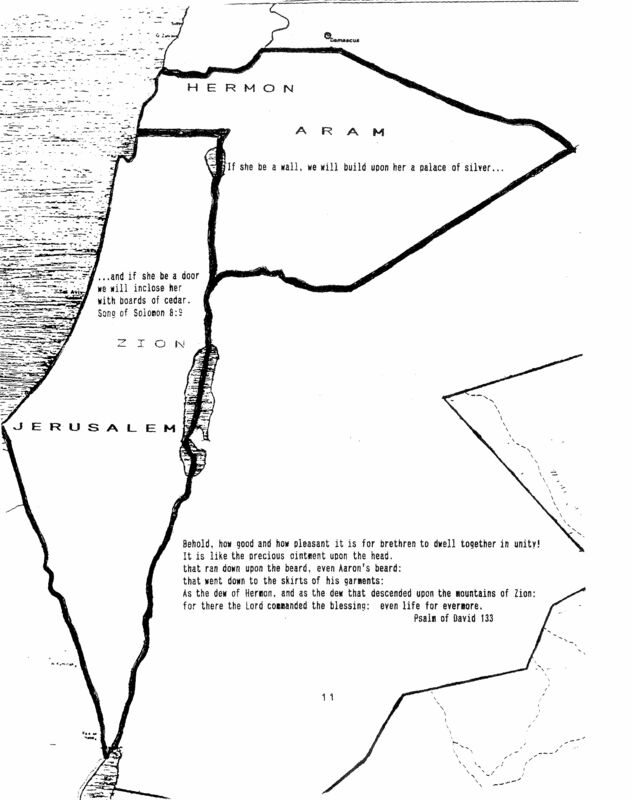 A mechanism will also be established in the Constitution of the State of Jerusalem whereby other portions of what is now called Israel (including areas incorporated pursuant to parts IV & V of this proposal) may be annexed or otherwise incorporated into the State of Jerusalem so that there will ultimately be but one nation in the land west of the Jordan river and the Sea of Galilee and the Dead Sea and the Arabah down to the Gulf of Aqaba (see map below). Most importantly, this one nation, Jerusalem, will have one government centered in one capital, Jerusalem, and it will offer the citizenship of Jerusalem equally to all the children of Abraham, be they Jew, Muslim or Christian. PART VII, OR "PLAN DALET," ASSURES THE ASSEMBLY OF NATIONS THAT FUNDAMENTAL ISSUES OF LAW AND ORDER, JUSTICE AND EQUITY, CLAIMS AND COMPENSATION, CANNOT BE IGNORED. FOR INSTANCE, A PALESTINIAN AND HIS FAMILY WHO WERE DYNAMITED OUT OF THEIR HOME IN HAIFA IN 1947 CANNOT BE FORCED TO LIVE IN KUWAIT OR BEVERLY HILLS OR ANYWHERE ELSE. THEIR HOME, AND THEIR DESCENDENTS' HOME, IS HAIFA. A Bill of Rights for all citizens of the newly augmented Israel (per parts IV & V), with special provisions for the right of return of Palestinian Arabs and for claims and compensation and the redress of grievances held by Palestinians who choose to live in their homeland as law-abiding citizens of Israel. These rights will not be infringed or otherwise diminished in any way in cases wherein the jurisdiction of the new State of Jerusalem replaces the jurisdiction of the State of Israel, as stipulated in Part VI.3. PART VIII, OR "PART VANUNU," IS IN THE COMMON INTEREST OF THE COMMUNITY OF NATIONS, ESPECIALLY THE EUROPEAN COMMUNITY FROM THE URALS TO THE BRITISH ISLES, WHERE ISRAEL'S NUCLEAR FORCES ARE NOW TO BE WEIGHED ON THE WORLDWIDE STRATEGIC BALANCE. 1. Accession by the State of Israel to the Nuclear Non Proliferation Treaty with additional protocols for mutual monitoring by Iran and Israel of their nuclear programs under supervision of the International Atomic Energy Agency. 2. A conventional arms non-proliferation treaty, a nuclear arms non-proliferation treaty, and a chemical and biological weapons non-proliferation treaty, each to be made by Egypt, Lebanon, Iraq, Jordan, the proposed State of Aram, Hierosolyma (the proposed State of Jerusalem) and Syria, whereby each nation prohibits the importation and manufacture of all types of firearms, explosives, and other advanced weaponry including all kinds of weapons of mass destruction. Limitation, reduction and verification will be the guiding principles and strict standards for each of these treaties, which will transform the land between the Nile and the Euphrates rivers into a region free of weapons of mass destruction. The author of An Eight Part Peace Proposal for Greater Jerusalem notes that the tense situation along the Temple Mount in Jerusalem is a constant reminder of the urgent need for peace through better understanding rather than peace through sheer strength. Ignorance of the Bible is behind the fevered notion of blowing up the Dome of the Rock and the Al Aqsa Mosque and then putting in their places the next Jewish temple simply because the Temple Mount is truly the historic place where the first two temples were once located. Furthermore, the frequently repeated assertion that the Temple Mount with its Western Wall, or Wailing Wall, is the holiest place in Judaism is absolutely untrue. Nowhere in Torah (also called the Pentateuch, or the first five books of the Bible) is there any mention of Jerusalem let alone a temple anywhere in Jerusalem. And to a Jew, the Torah is the Almighty's law and blueprint for all mankind's peaceful existence. Only the plain truth can set us free: Israel's next, prophesied temple belongs between Beth El and Hai, about 10 miles north of the old city of Jerusalem. This is where Abraham first called upon the Lord and made an altar to Him. (Genesis 12:8) And this is the place that Jacob later called "the house of God" and "the gate of heaven." (Genesis 28:17) This is also where the Almighty subsequently told Jacob that "Israel shall be thy name." (Genesis 35:10) Indeed, the Torah tells us this place called Beth El is endued with a spiritual significance so sublime that it is beyond compare! On the other hand, the story of how David came upon and bought the Temple Mount site in Jerusalem is from the Book of Chronicles, which, strictly speaking, is not a book of the Torah and therefore has less authority than a book of the Torah such as the Book of Genesis. Note well that it was not until after the ancient Israelites had rejected the Almighty Himself as their King (I Samuel 8) and had set a man (Saul) to be king over themselves that their jealous Lord by and by put the idea of a temple into the head of Saul's successor, King David. (I Chronicles 17) Shortly afterwards, David's diabolical decision to take a census of the Israelites -- a people foretold in Genesis to be numberless like the stars in the sky or the sands of the sea or the dust of the earth -- again provoked the Almighty's long lasting wrath. Thus it was the Almighty's wrath that ultimately led David to the threshingfloor of Ornan the Jebusite and it was the Almighty's wrath that caused David to buy this land for a temple site (I Chronicles 21), where his son Solomon was later to build the first temple. And so the discovery by David of the Temple Mount site, previously known as the threshingfloor of Ornan the Jebusite, was part of the enactment of divine retribution against David and the Israelites. This is an amazing but true fact recorded in Scripture. Moreover, the entire chain of events that led David to this place, known then as the threshingfloor of Ornan the Jebusite but now known as the Temple Mount in Jerusalem, was the direct result of a choice made by David at the behest of the prophet Gad (I Chronicles 21:11-13); this circumstance is not in accord with the positive command in Deuteronomy 12:5, to seek the habitation of the Almighty, a "place which the Lord your God shall choose." "Now when Solomon had made an end of praying, the fire came down from heaven, and consumed the burnt offering and the sacrifices; and the glory of the Lord filled the house." "And the Lord appeared to Solomon by night, and said unto him, I have heard thy prayer, and have chosen this place to myself for an house of sacrifice." And it shall be answered, Because they forsook the Lord God of their fathers, which brought them forth out of the land of Egypt, and laid hold on other gods, and worshipped them, and served them: therefore hath he brought all this evil upon them." History of course shows us the doom that was prescribed not only for the first and second temples in Jerusalem, but also for the ten tribed House of Israel which was carried away and made to disappear by the Assyrians when the first temple was still standing, and for the House of Judah which the Babylonians carried away but later, by the decree of the Persian King Cyrus, was allowed to return to Jerusalem and build the second temple, the remains of which are mistakenly revered by Jews throughout the world to this day. It is also important to understand that the Koran makes clear reference to the destruction of the first temple by Nebuchadnezzar in 586 B.C. and of the second temple by Titus in 70 A.D. and the revelation concludes: "It may be that your Lord may yet show mercy unto you." (Sura Bani Isra'il 17, Ayat 4-8) These hopeful words of the Almighty were spoken directly to the Children of Israel through the prophet Muhammad more than five centuries after Jerusalem fell to the Romans! Can "your Lord" be so very different from Muhammad's Lord? Do not Christian, Jew and Muslim all believe there is one God, the Lord of Lords and King of Kings? But if only the Children of Israel would be guided by the Torah and only the Torah and realize their full potential in Beth El! Stubborn habits and old traditions die hard. For example, a Lubavitch Rabbi in New York City, Abraham Stone (770 Eastern Parkway, Brooklyn, New York 11213), wrote in a newspaper article published by the Jewish Press of 19 November 1993 (page 64) that the Beth El location cited above from Genesis 28:17 is in fact the Temple Mount in Jerusalem and that this scripture proves that the Temple Mount is where the third temple should be built! Stone acknowledges that this scripture is the authoritative source giving the right location for the temple, which is quite correct. But he insists that Beth El is the Temple Mount location in Jerusalem, which is an assertion that is simply not supported by Scripture! Indeed, Beth El is cited as early as Genesis 12, as pointed out above, well before any mention of Jerusalem in the Bible. Beth El appears again and again in Genesis, whereas Jerusalem does not appear anywhere in the Torah (or first five books of the Bible)! In I Kings 12:25-29, Jerusalem and Beth El are mentioned in the same context as two different place names, the latter being the place where the rebel King of Israel set up a golden calf so as to keep his subjects from returning to worship at the first temple on the Temple Mount in Jerusalem in the rival Kingdom of Judah. Clearly the Temple Mount in Jerusalem and Beth El are two different places, and Genesis 28:17 tells us, as even Rabbi Stone has already affirmed, Beth El is the place that the Almighty chose for his habitation! "Beautiful for situation, the joy of the whole earth, is mount Zion, on the sides of the north, the city of the great King." A diplomatic approach to this subject may very well be that the greater metropolitan area of Jerusalem could include Beth El in the final peace agreement between the Arabs and the Israelis. The spiritual significance of Jerusalem the city will not be diminished a whit by recognition and acceptance of Beth El as the next temple site. Second, in this same regard it should also be noted that Ezekiel prophesied there would be among the portions finally allotted to the twelve tribes one separate portion comprising land for the sanctuary of the Lord, for the priests of the sanctuary, for "a profane place for the city, for dwelling, and for suburbs," and the remainder for the prince. (Ezekiel 48:7-22) Inasmuch as this extra portion contains a sacred place "for the sanctuary of the Lord" as well as "a profane place for the city, for dwelling, and for suburbs," it cannot be more clear that the sanctuary is not supposed to be located inside the city! Third, Ezekiel, upon beholding from his vantage point on a high mountain the vision of the future temple, indicates that there was "as the frame of a city on the south," which must be old Jerusalem as the center of the new Jerusalem. (Ezekiel 40:2) Isn't it clear that if Jerusalem appeared just to the south of Ezekiel, then Ezekiel stood just to the north of Jerusalem? And isn't Beth El located just to the north of the old city of Jerusalem? Is it only a coincidence that Ezekiel, in his vision of the future temple, stood in or near Beth El, the very same place that Jacob called the "House of God and the Gate of Heaven" after the Almighty had begun to communicate to Jacob in a dream the spiritual significance of the place? Rabbi Stone later retreated somewhat from his Beth El is Mount Moriah (or his Beth El is the Temple Mount) position when, in the Jewish Press of 1 December 1995 (page 9), he quoted from Rashi, the preeminent Biblical commentator who lived in the European diaspora from 1040 to 1105 A.D., that, with reference to the account of Jacob at Beth El in Genesis 28:17, "Mt. Moriah (the Temple Mount) was uprooted and was brought to the site where Jacob was lying." Unbeknownst to Moses himself not to mention modern day geologists and archaeologists, Stone's assertion is sheer nonsense that only compounds ignorance and promotes confusion on a truly vital question on which the peace of Jerusalem hinges and must therefore be totally rejected! That the Temple Mount in Jerusalem is associated with Divine retribution echoes throughout history. Beyond the aforementioned destruction of the first temple by the Babylonians and then of the second by the Romans pursuant to the Almighty's promise of punishment as expressed in chapter 26 of Leviticus and reiterated in the previously cited caveat of II Chronicles 7:19-22 right after Solomon's dedication of the first temple, the Evangelist Matthew (St. Matthew 24:1-2) records that Jesus Christ himself put a curse on the temple in Jerusalem when, shortly before his arrest, he looked at the buildings of the temple on the Temple Mount in Jerusalem and told his apostles: "See ye not all these things? verily I say unto you, There shall not be left here one stone upon another, that shall not be thrown down." If one were to take Jesus fully at His word as mankind fast approaches the twenty-first century and bears witness to the ever unfolding progress in the technologies of modern warfare, one must acknowledge that this prophecy of total destruction has not yet been completely fulfilled despite the best efforts of the Jews and their Roman conquerors under Titus; for the Western Wall, being part of Herod's refurbishment of the second temple, was standing when Jesus uttered his malediction against "the buildings of the temple" and it is still standing today! Can it be that the remainder of this curse may yet prove to be causeless and therefore will not come if there is a change of hearts and people seek for and go to Beth El, the habitation of the Almighty that He Himself has chosen through his prophets? Centuries later, the Temple Mount in Jerusalem became the objective point of numerous military expeditions from Europe, which are known as the Crusades or Holy Crusades; the blood and money and toil expended for these cruel and crazy and futile ventures can only be viewed as the product of ignorance combined with misguided fervor or religious fanaticism. In these dark pages of history, the wrong temple site became a most worthy goal of Europe's royalty, nobility and aristocracy, and even lent its name to the religious military order called the Knights Templars; thus their acquisition of the Temple Mount in Jerusalem became one of their justifications for war; indeed, it is noteworthy that even today the putative heir to the now defunct throne of the Hapsburgs, Otto von Hapsburg, still styles himself, among many other titles listed in the European edition of Who's Who, "King of Jerusalem"! So does King Juan Carlos of Spain have the additional title "King of Jerusalem"! Yet neither man can show the correct, prophesied location for the real Israel's next temple! And black Gehenna called, the Type of Hell." Milton's genius clarifies the Almighty's commandment to Ezekiel, "...show the house to the house of Israel..." (Ezekiel 43:10); to obey such a command, the prophet must be able to distinguish between two vying temple sites that are in close proximity to each other, as are Beth El and the Temple Mount. Indeed, if the correct temple site were so very obvious to all, then there would be no need for a prophet to "show the house to the house of Israel"! Likewise, were the whole world -- even the very elect -- deceived as to the correct location for the next temple, as is the case today with the Temple Mount in Jerusalem, then a prophet would surely be needed to set the matter straight and to "show the house to the house of Israel." Otherwise, the wrong choice, "the Type of Hell," would continue to be made without any warning to the Almighty's chosen people. It must be understood that Ezekiel was among the Jewish captives when the House of Judah fell to the Babylonians along with Jerusalem and the first temple. But the House of Israel, to whom Ezekiel was charged to "show the house," had already been made to disappear at the hands of the Assyrians more than one hundred years before the Babylonian captivity. Ezekiel was never in direct contact with the House of Israel when he prophesied and his prophecies are therefore for the end time. Furthermore, the Christian concept of a spiritual temple actually comprising the faithful and the elect and indeed Jesus Himself need not preclude the idea of a physical Israelite temple, just as John the Baptist's express need for baptism by Jesus did not preclude John's baptism of Jesus; for, as Jesus said, "Suffer it to be so now: for thus it becometh us to fulfil all righteousness." (St. Matthew 3:13-15) Building the next temple in Israel will indeed fulfill all righteousness, but only if the right location in Beth El is chosen! But the choice of the wrong location -- on the Temple Mount in Jerusalem -- for the next temple in Israel remains a constant threat to world peace. In this very decade right before the twenty first century we have already faced a controversy of parallel proportion with the still pending threat of Jewish extremists blowing up the Dome of the Rock so as to build in its place on the Temple Mount in Jerusalem the third Jewish temple; I refer to the destruction of the Babri Mosque in the Hindu holy city of Ayodhyatoday on 6 December 1992, which resulted in brutal rioting throughout India between Hindus (82% of a total population of 844 million) and Muslims (12%). The Babri Mosque was built in the sixteenth century and is said to stand on the site of an old Hindu temple that marks the birthplace of the Hindu god Ram. As Hindus clamored to destroy Al-Babri the Government of India gave assurances that the mosque would be protected. Suddenly, however, the Indian Government was faced with a fait accompli and all the promises of protection were proved to be empty words. Will history repeat itself in another part of the world where the Mayor of Jerusalem, Ehud Olmert, once said just before his election victory over long time Jerusalem Mayor Teddy Kollek: "Do I say we have to wipe out the Dome of the Rock? I say, on the contrary, I'll do everything to invest in the quality of life of the Arab residents, much more than Teddy did. Teddy did nothing in this area." Will we rise one day to find another fait accompli and proof that Mayor Olmert's words had no meaning behind them? Or, does Mayor Olmert disguise a conviction that the third Jewish temple on the Temple Mount will be an investment in the quality of life of the Arab residents? The stakes are very high indeed. The source of all the strife, upon close examination, emanates from the "elephantiasis of intellect and atrophy of emotion" resulting from traditional beliefs that sometimes prevent clear understanding of Scripture and the collective wisdom of the ages. Thus, a temple site proposed by a man (King David) is preferred to the temple site revealed by God to Jacob and Ezekiel! This is not a good foundation for the temple or for peace! Here it would be good to consider that the prophets foretell the advent of three rather distinct peoples to the land of Israel near the end time: the return of the House of Judah, the return of the House of Israel and the intrusion of the people of Gog and Magog. The choice between the right and wrong locations for the next temple represents a way to separate, so to speak, the tares from the wheat among them. The House of Judah largely consists of those Israelites of the Babylonian captivity who kept their Sabbath-keeping identity and Hebrew language intact. They are descended from the tribes of Judah and Benjamin and Levi, which made up the Kingdom of Judah that the Babylonians took into captivity. They are the survivors of the Babylonian exile and the Roman occupation and their descendants are known today as the Sephardic Jews. Thus it was the House of Judah only that kept its distinctive Sabbath keeping identity and Hebrew language intact and is therefore known as the Sephardic Jewry of today. The House of Israel, though still heir to the promises just like the House of Judah, does not for the most part have a Torah based Sabbath keeping identity or Hebrew speaking facility today because the descendants of these ten tribes of Israel lost these traits during the Assyrian captivity and subsequent assimilation into northern and western Europe. Even so, the spirit of the prophet Ezekiel will eventually show them the house that the Lord God of Israel has chosen for Beth El. "In spite of the negligible information of an archaeological nature, the presence of Jewish groups and the impact of Jewish ideas in Eastern Europe are considerable during the Middle Ages. Groups have been mentioned as migrating to Central Europe from the East or have been referred to as Khazars, thus making it impossible to overlook the possibility that they originated from within the former Khazar Empire." These Jews of the Khazar conversion are among the Turkic people of Gog and Magog and are known today as the Ashkenazi Jews of central and eastern Europe, whereas the Jews descended directly from the House of Judah are, as stated above, principally the Sephardic Jews. The Sephardic Jews are of Semitic origin just like the Arabs and the Ashkenazi Jews are of Turkic and European origin; it is indeed ironic that the term "anti-Semitism" arose among these Turkic Khazar-derived Ashkenazi Jews in Europe. Thus, when these identities are firmly established in one's mind, one readily understands the prophecy of Ezekiel (Ezekiel 39:2) wherein a remnant of one-sixth of Gog will survive and be brought from the north to the mountains of Israel. This is the extermination of the Ashkenazi Jews at the hands of the Nazis and the Zionist emigration out of Europe into Palestine, which is commonly mistaken for the ingathering, or the prophesied return of the House of Judah and the House of Israel to the Holy Land. For more information see http://www.show-the-house.com/id55.html. Thus has this militant Zionism of a decidedly Ashkenazic cast usurped in one fell swoop both the promise of a scepter to Judah and the real Jews of the House of Judah (Genesis 49:10) and the birthright promise to Joseph's sons (Genesis 48:20) and the descendants of the "lost ten tribes" of the House of Israel. One only needs to take an objective look at Zionism today to know the import of the question that God commanded Ezekiel to ask of Gog (Ezekiel 38:14): "Thus saith the Lord God; in that day when my people Israel dwelleth safely, shalt thou not know it?" Just turn on your television set to the world news to find out the answer to God's own reality-check for the people of Gog who have usurped the holy name of Israel and with their cruel and crazy full spectrum fraud and force have made the name of Israel to stink in the assembly of nations! "And think not to say within yourselves, we have Abraham to our father: for I say unto you, that God is able of these stones to raise up children unto Abraham." Virtually anybody is eligible to belong to the Abrahamic family and be heirs to the promises made to Abraham. For example, even a Lubavitch Jew whose origins are from Khazaria via central and eastern Europe, and therefore fits the Ashkenazic Gog and Magog type, may nevertheless transcend the terrible prophecies made concerning Gog and Magog by living according to the Golden Rule and obeying all the commands of the God of Israel. Surely in the vast sweep of history this end time prophecy of an ancient Hebrew prophet concerning "the strangers that sojourn among you" applies today to the indigenous Arab population of historic Palestine. The Turkish government has preserved the Ottoman Empire records of Arab land ownership in historic Palestine, which one may consider to be the default setting before the imposition of discriminatory restrictive covenants after land sales to Jews and, later, outright ethnic cleansing of Palestinians from their lands. After all is said and done, the Almighty is still the Judge and the Executioner for better or for worse; those who live in His favor will be the ones who look for and find the place that the Almighty has chosen for his habitation, which is Beth El. But the false impostors and others who do not look for and find -- or do not believe when shown -- the correct location for Israel's next temple are sowing the wind and will reap a whirlwind. Finally, it is worth adding that the Lord of Israel's jealousy was aroused by Samuel's fulfillment of a positive command written in the Book of Deuteronomy (17:15), to set a man as King of Israel. Being King of Israel is certainly no easy matter; perhaps being King of a truly democratic and integrated State of Jerusalem with one capital and one citizenship and a maximum range of settlement and opportunity for Jews, Muslims and Christians alike is more in keeping with the spirit of prophecy, particularly the spirit of Ezekiel, as just set forth above in Ezekiel 47:22. At any rate, being the first to know and understand and actually expound on where the next Israelite temple really belongs is a very good beginning. This is the only way for a Jew to perform the mitzvah of all mitzvahs. A Christian skeptic need only remember the words of Jesus to Nicodemus: "If I have told you earthly things, and ye believe not, how shall ye believe, if I tell you of heavenly things?" (St. John 3:12) And a Muslim can relax as the danger of an assault on the Dome of the Rock and the Al-Aqsa Mosque goes away. Everybody will be happy! The author of An Eight Part Peace Proposal for Greater Jerusalem regrets that he finds it necessary to present to his audience a conspiracy theory; he is reasonably confident that this theory, if put fully to the test, will make all of us witnesses to a monumental act of deception. The author also wishes to emphasize that, with the exception of this Appendix C, his peace proposal is basically an action programme and not a discussion paper. He shall endeavour to answer as best he can written inquiries from LIBERTY NEWS subscribers which are sent to P. O. Box 449, New York, NY 10185 (This address is no longer current. ).